About: Modern and chic and everything in between…welcome to the Ivy House and apartment 3RR at 786 Washington Avenue. This stunning pre-war 1 bedroom gem offers a superb layout in one of the best locations in Brooklyn. Sun drenched and located in prime Prospect Heights, apartment 3RR boasts an inviting and spacious living room, a modern renovated spa inspired bathroom, and an airy yet tranquil bedroom, looking over the neighboring gardens. Located at the borders of Park Slope and Crown Heights, the building is right up the street from the Brooklyn Botanic Gardens, Prospect Park, Brooklyn Public Library, and the Brooklyn Museum. It’s priced at $539,000 and listed by Corcoran’s Laura Hess. About: This tastefully renovated top floor PENTHOUSE in Ditmas Park offers two bedrooms and two bathrooms with a lovely industrial spiral staircase leading to your own roof deck with 360 degrees of STUNNING spectacular views. This immaculate condo is one of a kind. First, impress your guests in your new chef's design open kitchen with upper white and lower grey cabinetry, glass subway tile back splash, state of the art appliances including a touch-less faucet and hidden microwave oven under the elongated cascading quartz counter-top breakfast bar, and plenty of additional cabinet space. Wemo light switch technology allows you to schedule when kitchen overhead lights go on or off or simply control from your phone. Additional penthouse features include recessed lighting, bonus electrical outlets on center island, elongated oversize insulated windows, full sized washer/dryer, and hard wood floors throughout. The spacious open living space currently used as a living and dining open concept, can be easily converted to a three bedroom apartment. The second bedroom may serve as an office, den, library or guest bedroom. Listed by Corcoran’s Aurora Maldonado. About: Bright and spacious corner studio in one of West End Avenue’s most desirable buildings. This perfect starter apartment or pied-a-terre features bright eastern exposures, a tastefully renovated kitchen with convection oven, a windowed bath and hardwood strip floors. Two large closets are conveniently located in the entry foyer. 9-foot beamed ceilings make the space so light and airy. A queen size Murphy bed has been added as a wonderful space saver. The Emery Roth designed building was constructed in 1924 and features a full-time doorman, laundry, bike storage, live-in superintendent and central laundry facilities. The low maintenance includes electricity (additional summer surcharge applies). Sorry, dogs are not permitted. About: Enter intro a gracious entry gallery and be led to an enormous west-facing living room with high ceilings, exposed brick and wide plank hard floors. An automated home theater system with 7.1 surround sound, 130" HD projection screen and savant home automation provide a true entertainment experience. Speakers are integrated into the walls and ceiling so as to be hidden from view. The expertly designed open kitchen has solid walnut cabinetry, marble counters, 36" wolf range with infrared grill, pot filler handmade copper hood with 1200 CFM external exhaust, Insinkerator disposal, Wolf Microwave, Miele dishwasher and Subzero refrigerator, enormous private Ipe roof. Custom stairs lead to the master suite with great light from two exposures and is pin drop quiet. The master bath features a steam shower with frameless glass enclosure, integrated sound and top of the line fixtures. A custom-built walk-in closet has ample storage for your entire wardrobe and integrated private laundry. 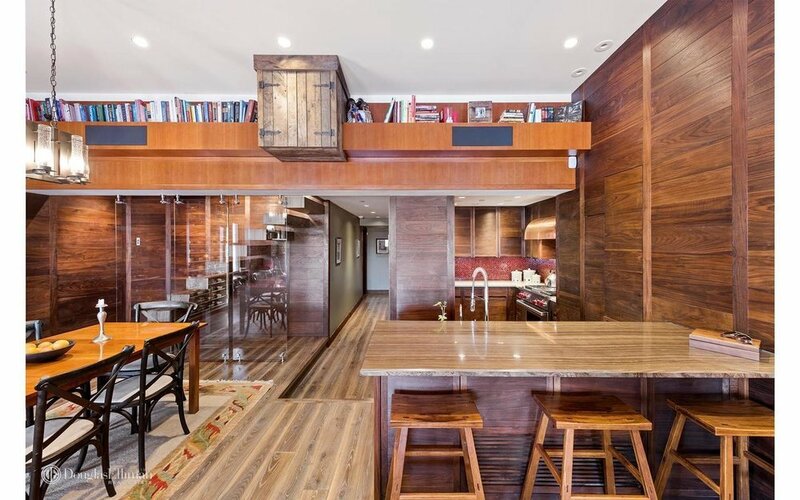 Step out onto your enormous private roof deck finished in Brazilian hardwood, perfect for dining al fresco or reading a great book as you soak in the sun. 200 Mercer is a well maintained pet friendly building with video intercom and full-time superintendent. WHERE: 350 West 71st st.
About: Welcome to your new three-bedroom, two-and-a-half-bathroom home at 350 West 71st Street, where classic elegance meets contemporary condominium living. The living room faces onto a lovely tree-lined cul-de-sac street and overlooks picturesque historic buildings. Each of the bedrooms faces east to a garden view. Cooking is a pleasure in the open kitchen, outfitted with custom Italian cabinetry, Olympian Danby marble countertops and backsplashes, and Miele appliances. The stunning master bathroom features a custom Italian vanity with honed Grigio Nicola marble countertops. The heated floor is comprised of honed Grigio Nicola hexagonal tile, while the walls are surfaced in honed statuary marble tile. Stylish Waterworks fixtures complete the picture. The ceiling height is approximately 9'6".